Apparition comes from the word appear, that is to come into sight. Not a surprise, is it? Apparitions are unfriendly and unwanted appearances, that just suddenly come into the picture. Examples of these are the ones made by ghosts. By the way, the ghosts/apparitions in our poster are pretty friendly. 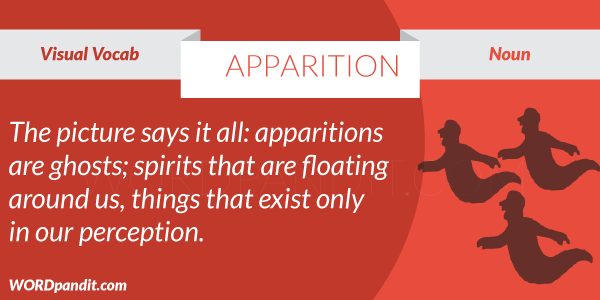 As an extension of this appearance, apparition as a noun came to mean ghosts only. 1. A ghostly figure; a specter. 2. A sudden or unusual sight. 3. The act of appearing; appearance. 1. Supposed apparitions can scare the hell out of children. 2. The native Red Indians were amazed at the apparition of these white strangers that began to inhabit their land. There is a horror movie-named ‘Apparition’.